Modern armed forces could cope with the loss of some space-based capabilities, but disabling orbiting assets would be a "game-changer" in the areas of imaging, positioning and ballistic missiles. Relatively small militaries, such as France or the UK, would be at a disproportionate disadvantage compared with China, Russia or the USA, which boast vastly greater air and space resources. That is the preliminary conclusion of a study on "space Armageddon" by two French army officers, Maj Alexandre Dubreucq and Maj Francois Lamothe, who presented their study at the Royal UnitedServices Institute in London on 16 January, during a conference called: "Is space the new cyber? UK dependencies and vulnerabilities". Dubreucq and Lamothe, working through France's Ecole de Guerre, are studying the potential effect of some 30,000 large pieces of orbiting debris – leftover rocket bodies, defunct satellites, mission cast-offs such as lens covers, and fragments of spacecraft created by fuel tank explosions or collisions – which threaten to damage or destroy valuable satellites. To date, collisions between debris and active spacecraft have been rare, but experts fear that, once started, a cascade of collisions could leave valuable orbits unusable and even create a blanket of debris that threatens launch attempts. A fragment larger than 1cm (0.4in) would result in mission-critical damage, given impact speeds of 15m/s or more. The pair believe that the loss of weather forecasting and communications information would not be devastating, as radio is a back-up – although while operations could continue "much as normal", forces would suffer greater "uncertainty and hazard". But imaging from space, vital for targeting purposes, would have to be replaced by aerial photography. Some places cannot be overflown – China and Russia, for example – and they note that any quickly organised overflight is hazardous, if not impossible, in contested airspace. In imaging, say Dubreucq and Lamothe, larger air forces able to sustain losses would have an advantage if space-based assets were denied. The loss of positioning – from GPS, Galileo or Glonass satellites – would be another game-changer, they believe. Forces have become accustomed to precision navigation via hand-held devices and the only alternatives are inertial systems or navigation by the stars – which Lamothe describes as "not convenient". The third critical loss would be the effectiveness of ballistic missiles, especially those launched by submarines. While submarine crews are trained to shoot stars should satellite positioning be lost, and the missiles can be guided inertially, they cruise at an altitude of about 1,000km (620 miles), where the orbiting debris field is at its densest. Lamothe contends that in a debris crisis, France or the UK would not have enough missiles to remain credible. 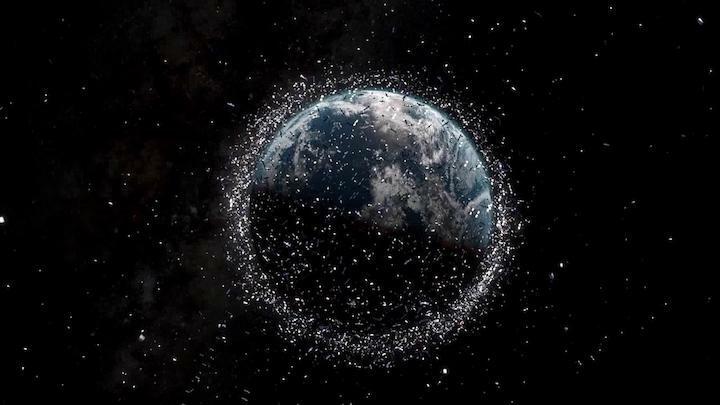 Experts typically regard a cascading debris crisis – named the Kessler syndrome, after the NASA scientist who proposed it in 1978 – as a problem of increasing probability as the number of launches increases. But given the difficulty of tracking debris pieces much smaller than about 10cm, Lamothe wonders: "Maybe it has already begun?"